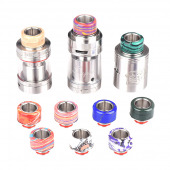 These wide-bore amazing drip tips have a flat top, a slightly beveled outer edge, and two o-rings. Constructed of ceramic and polished stainless steel, these tips look fantastic and stay cool! 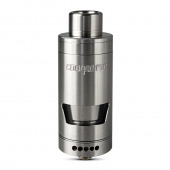 The Conqueror by Wotofo utilizes one of the first dual coil postless build decks found in a rebuildable tank system. Allowing users to create even more dynamic horizontal coil based systems with the additional deck space.